Arizona Geological Society - Fall Field Trip - Debris Flows Shape the Sabino Canyon Landscape - look out below! Fall Field Trip - Debris Flows Shape the Sabino Canyon Landscape - look out below! Sabino Canyon Visitor Center Patio, located at 5900 North Sabino Canyon Road, Catalina Foothills, Arizona. The AGS is grateful to the Arizona Geological Survey for covering the costs for the guidebooks. Note: Participants will be responsible for a $5.00 parking fee at the Sabino Canyon Visitor Center and an $8.00 tram ticket for the ride up the mountain. Debris Flows Shape the Sabino Canyon Landscape - look out below! Tour Description: AGS Members and their guests are invited to join the Arizona Geological Survey tour of debris flows in Sabino Canyon. 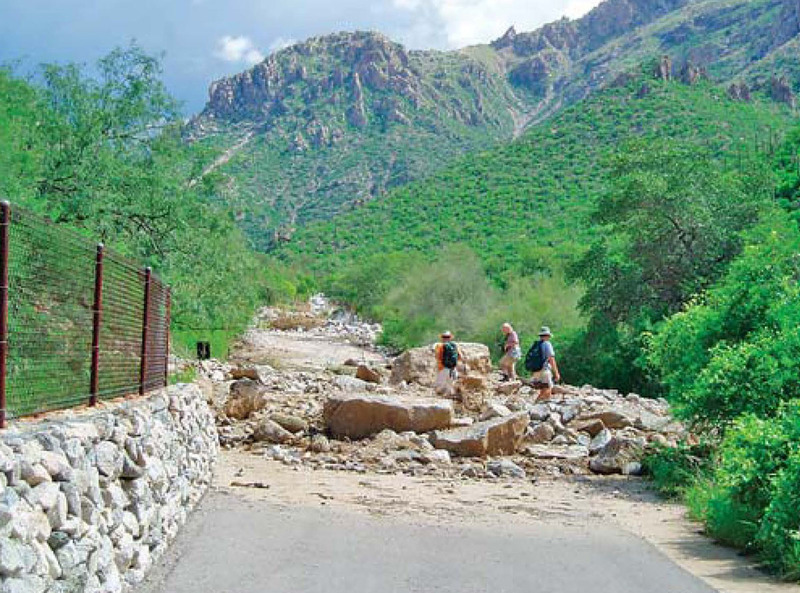 During late July 2006, heavy rainfall in southern Arizona produced record flooding in several larger drainages and triggered numerous debris flows in the Santa Catalina Mountains and elsewhere throughout southeastern Arizona mountain ranges. These debris flows did a remarkable amount of geomorphic work in a very short time, eroding hillslopes and channels and transporting very coarse sediments that garden-variety 100-year floods likely will not move. Field Trip Date/Time/Location: Saturday, November 15, 2014. Check-in begins at about 8:30 AM at the Sabino Canyon Visitor Center Patio, located at 5900 North Sabino Canyon Road, Catalina Foothills, Arizona. Route: We will catch the 9:00 A.M tram and take it to Rattlesnake Wash. Here and elsewhere along the tram road, we will examine debris flow deposits that formed in 2006. The final stops will be at the top or northeast end of the tram road, elevation approximately 3,200 feet. We return to the Sabino Canyon Visitor Center via the tram or down the Telephone Line Trail, about a 3-mile walk. The field trip will end around 12:30 PM. Conditions & Recommendations: All attendees should wear appropriate footwear for moderate hiking, which will be mostly along the tram road. Long pant and long-sleeve shirts are recommended for protection from the sun and vegetation. Be sure to bring your own snacks and water, as none will be provided by the AGS. Guidebook: Field trip guidebooks will be provided to trip participants. One copy is recommended to be shared among couples or family members. The guidebook will summarize the mechanisms responsible for triggering debris flows, the damage they can do, how frequently they may occur, and the importance of these extreme events in shaping the mountain landscapes of Arizona. Additional guidebooks will be produced by the AGS following the trip, which can be purchased at our dinner meetings. Fees: This field trip will be free to all AGS members and guests. However, each participant will be responsible for a $5.00 parking fee at the Sabino Canyon Visitor Center and an $8.00 tram ticket for the ride up the mountain.